In 1964, Sean Connery ejected the baddie from the passenger seat of James Bond’s Aston Martin DB5, heralding the screen debut of one of the world’s most iconic cars. In spite of the high-tech shenanigans in Goldfinger, the luxury car maker is steeped in tradition. Famously, all Aston Martins are manufactured by hand at its factory in Gaydon, Warwickshire, but a century since the first car was built, the company is embracing IT, in all areas of the business. A modern IT environment is very much part of the Aston Martin brand, where the use of advanced technology is balanced with traditional manufacturing. The design process starts with sketches that end up as 3D CAD diagrams – the first sketch may be drawn on paper or using a Wacom tablet. The sketch is then scanned into Autodesk Alias through a process called digital validation. The designer maps the scanned sketch onto a 3D wireframe model. C100 has a top speed of 180mph and can accelerate from 0-62mph in under four seconds. A key part of the design process is the creation of several quarter-size models that are used to ensure the car looks as the designer intended. In the design studio, modellers work with designers on the quarter-scale clay models. Design is an iterative process. A sculptor works the clay model with the designer to ensure the curves on the model look the way the designer intended. Initially, tin foil is used to show how light falls on the model. Eventually the model is painted and viewed under controlled lighting in the design studio, allowing the team to see the lines and curves of the model’s bodywork. Once the design is complete, it is a scanned into a computer to build a 3D model. The scan creates surface data quickly through AutoDesk 3D Studio. Aston Martin also uses Alias and Maya to build photorealistic 3D models (CGI). These are used to help designers visualise the car. Rendering photorealistic CGI images from CAD diagrams takes a large amount of processing power, and Aston Martin is pushing the limits of the Nvidia GPUs in its engineering workstations. 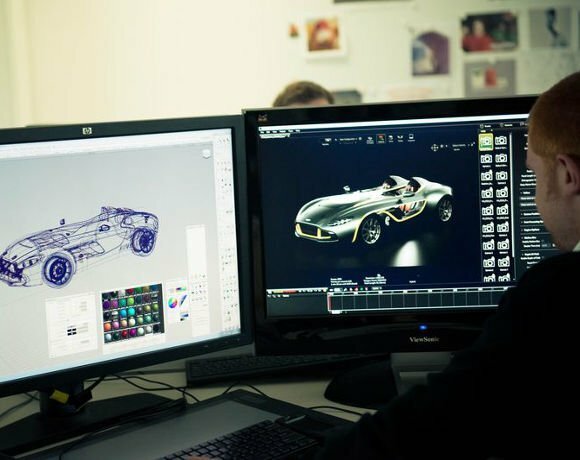 Once designers are happy with the digital model, a full-size image is rendered and projected in high definition (HD) in Aston Martin’s Digital Design room to enable the designers to sense how the finished design will look using Showcase, Autodesk’s presentation software. The final part of the design involves building a one-off full-size clay model. A computer numeric control mill is used to sculpt the clay based on the CAD data. 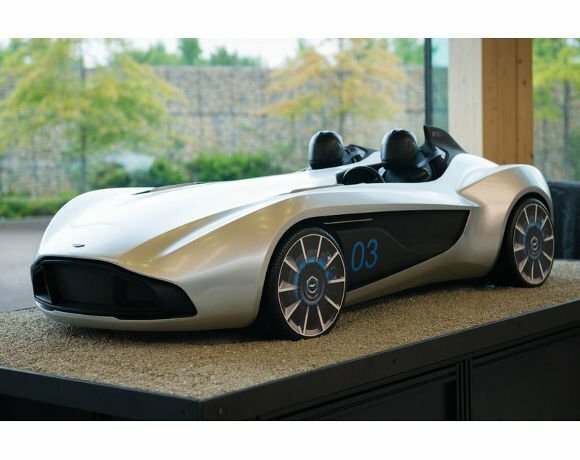 Aston Martin uses a Fortus Dimension 3D printer to create certain parts for the model to add realism and reduce cost. “The 3D printer helps us design and print highly realistic models in the studio,” says Dibsdale. 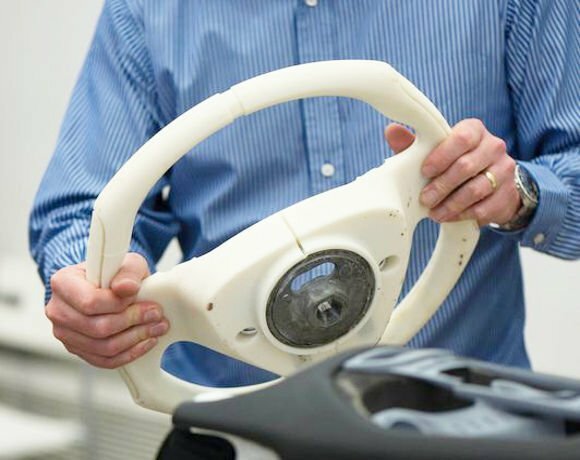 One area where it is used is in printing one-off alloy wheels for the full-scale model, made of resin. Creating a one-off wheel would cost £50,000, while printing in 3D is about £1,000, he says. The clay model is coated with a product called Dynoc, which has a metal-like texture to match the car’s finished bodywork. The £200,000 full-size model is viewed both inside and outside the design studio, so the designers can see how the car would look in natural light. Once the designers are happy with their creation, the CAD technical diagrams are exported to Siemens’ Teamcenter software to manage product and process knowledge. Aston Martin shares the CAD diagrams with its European suppliers using Majenta Exchange, a high-end, secure FTP service. Computer Weekly visited the Aston Martin production line in June. Within the factory, the cars are entirely hand-built, apart from a robot that lays down an even layer of adhesive for gluing the body panels. There is also a robot to weave the million-plus stitches needed to create the “V” logo in the Aston Martin Vanquish’s head rest. Apart from these, everything else is done by hand. Each component is barcoded when it comes into the factory and as a car is moved manually along the production line from one station to the next, staff have 30 minutes to fit the part or complete the required task before another piece of work arrives. Over the past few years, Aston Martin has replaced its accounting system with Microsoft Dynamics AX, and is currently deploying Microsoft Dynamics AX 2012 to provide an accurate and resilient product structure and engineering change management environment. The IT department has also begun migrating to a cloud-based computing model for many functions. For the past year, it has been using Microsoft’s Office 365 cloud-based service to provide access to Microsoft Exchange and office productivity software. For its office staff, Aston Martin selected the Office 365 E3 plan, which provides licences for Microsoft Office 365 ProPlus, Exchange Online, Lync Online and SharePoint Online. 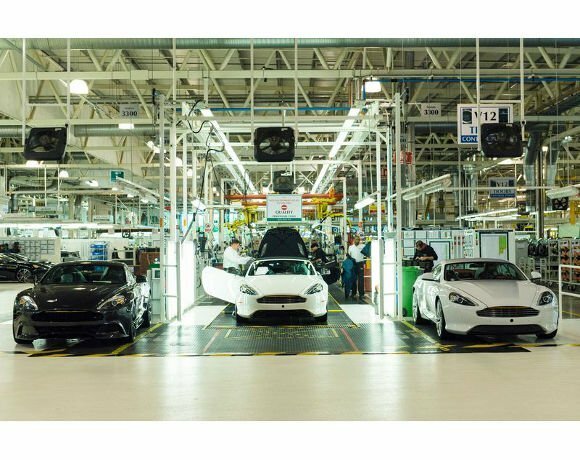 On the server side, Aston Martin has switched from a Sparc-based Unix environment to Hyper-V/Suse to run its Siemens product lifecycle management (PLM) system. Implemented in May 2013, the core system will use Hyper-V to run Suse Linux 11 SP2 on HP BladeSystem hardware. Along with using Hyper-V/Suse in its PLM, he says Aston Martin also uses Microsoft Server 2012 Hyper-V to run its SharePoint Server 2013/SQL Server 2012 environment.